Jean Gnonlonfoun is a drummer, percussionist, bassist, improviser and composer. Sysmo, Gankpo, Ago Benin Brass, Marockin ‘ Brass, Ander Brass, the Peas Project, Baloji & La Katuba, Azéto Orchestra, Gansan, Gospel for Life, Patel, Gangbé Brass Band, Jomion & les Uklo’s, Tangawissi to name but a few. 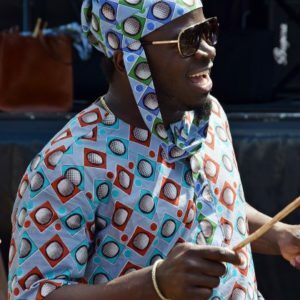 Since 2012 he gives workshops in polyrhythmic training for professionals as well as workshops of presentation and musical initiation for young people.